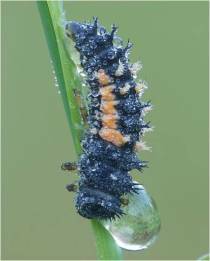 Did you know, the number of beneficial insects and ‘benign’ or ‘harmless’ insects, far out-number so-called pests? The Numbers Say It All……. I saw an interesting statistic at the Natural History Museum in London, which I then confirmed by email: only 1000 of the 1 million discovered insect species, is actually a ‘pest’. 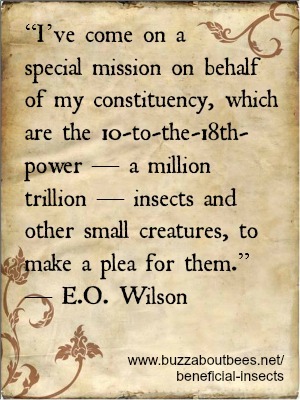 In other words, 999 out of every 1000 insect species, are actually harmless or of direct or indirect benefit! Another statistic I read, is similar. 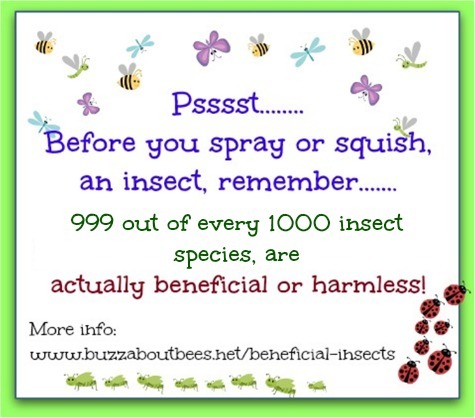 It said: 97% (or 97 in every 100) insects is beneficial or benign – see the link below for more information. Whichever you’d like to take as fact, both go to show that we hardly need to worry about insects being a threat, at all. 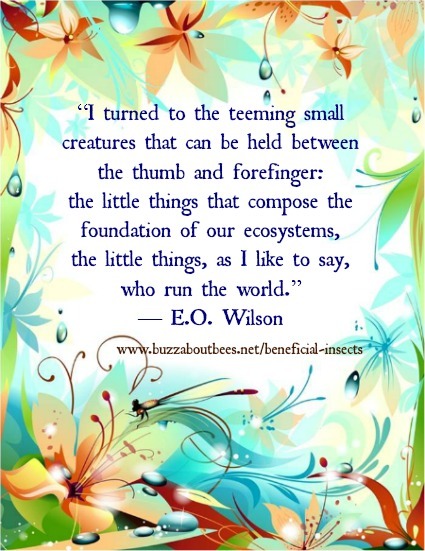 Yes, I know, there are freak incidents, but let’s not forget the myriad different ways in which insects quietly serve humanity, directly or indirectly, from pollinating food crops, or eating other ‘pests’, to helping maintain environmental stability through biodiversity. Why Is The Media So Misleading About The Threat Of Insects To Our Crops? 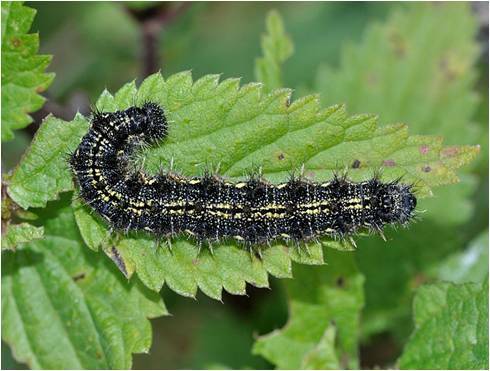 You could be forgiven for thinking that gardens are full of pests, and that the ratio of beneficial insects to ‘pests’ is actually more favourable to ‘crop eaters’ than it actually is. It seems we are bombarded with ads and features about how to control or kill this or that ‘pest’. Indeed, if space in gardening magazines were to more accurately reflect reality, I wonder, how different things might look? 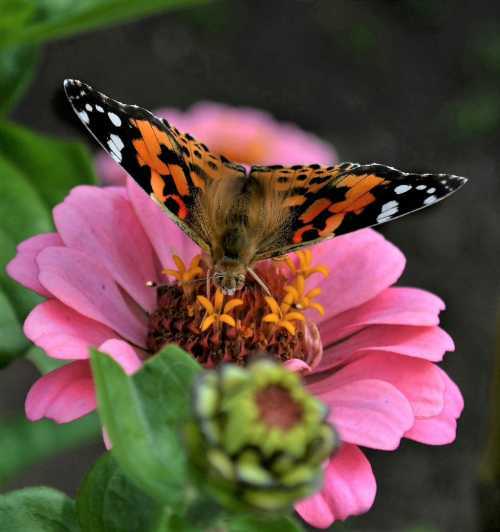 Magazines could focus even more, on how to attract and assist beneficial insects (and other invertebrates) – not just the common ones (lacewings, bees, ladybugs), but also the unsung heroes, the names of which many people have not even heard of. Perhaps we’d be provided with I.D. guides, and instead of general information about creating habitats, we might receive advice that is more detailed and specific. Heck, we might even be told how to avoid doing them harm! 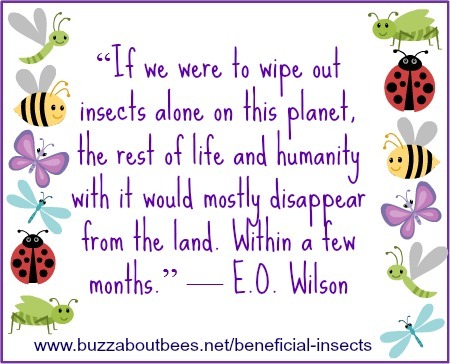 Don’t We Need To Get To Know Our Beneficial Bugs Better? How many beneficial insects and their larvae would you recognize? I’ll admit, I’m as guilty as anyone here. 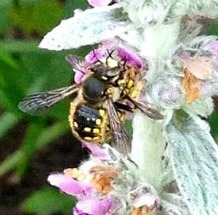 I know a fair bit about bees and not much at all about other insects. How many people are aware that one of our best loved insects spends part of it's life as such a strange looking little creature? it’s an Antlion – that is, lacewing larva (lacewings being highly beneficial in the garden, especially as predators of 'pests'). Below is an image showing the Antlion lifecycle. My point is, of course, that even beneficial insects we thought we knew well, might actually be more 'alien' to us than we thought. 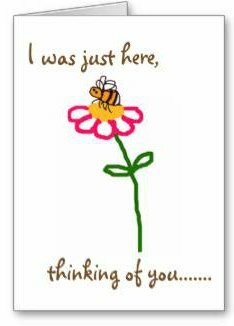 The little black fly that is squished or sprayed, might be a tiny solitary bee, a ladybug larva, or some other garden superstar! On the left is a wool carder bee, a harmless solitary bee species and excellent pollinator. On the right is a hoverfly (a marmalade fly) - both a pollinator and garden helper in natural pest control - the larva eats aphids. Both of these insects may be killed because they are mistaken for the character in the middle, a wasp. This is a shame. 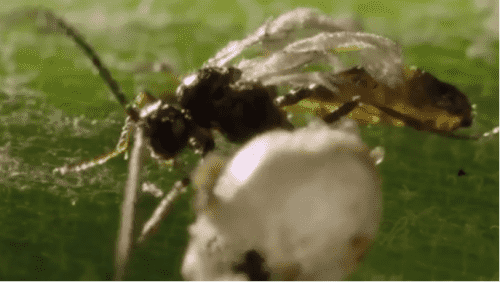 Wasps, like all pollinators, are having a hard time. I have written elsewhere on this site about the beneficial role of wasps. 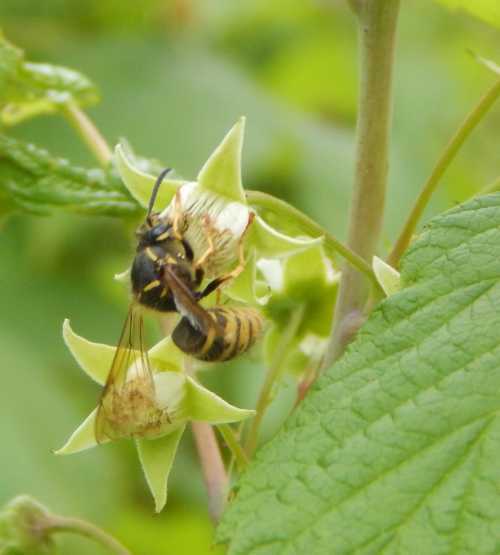 Above: Wasp pollinating our raspberries. 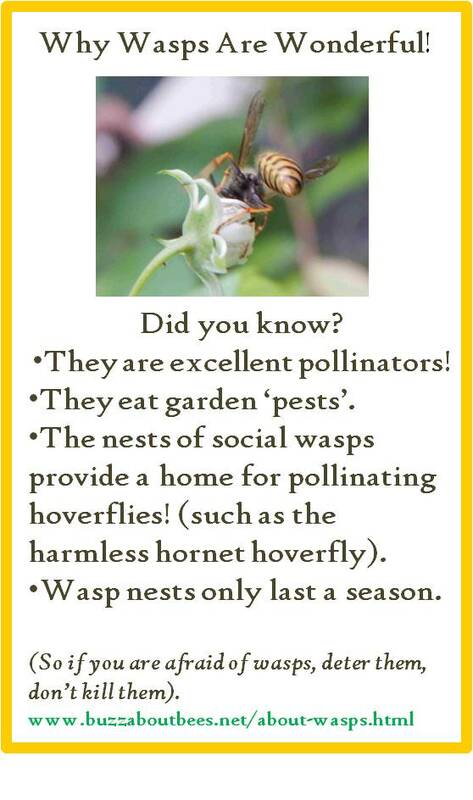 Wasps are amazing pollinators – and in my experience, especially of raspberries and blackberries. 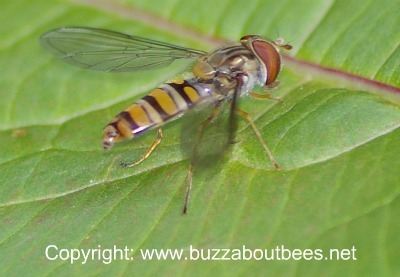 They also perform an important task in the garden – namely, natural pest control. You may come across a solitary wasp nest or a social wasp nest – either way, the nests only last a season. It can be inconvenient, granted, and a grumpy wasp nest is not one to be trifled with, but if you can ignore it, I would do so. If you are really afraid of wasps (sometimes referred to as yellow jackets in the US), it’s better to deter them – make or buy a Waspinator. Take a look at this page about treating and avoiding wasp stings. I have a further page about repelling and deterring wasps. Similarly, many people automatically kill ants in their gardens, assuming them to be pests, yet they contribute to soil quality. Things Could Be So Different, And Better! And what about garden centres? Of course, they are keen to sell us their pesticides. 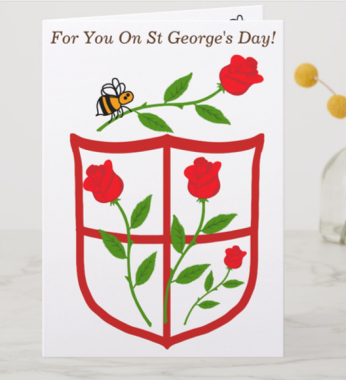 But if there was more appreciation of beneficial insects, they might be selling fewer pesticides, and more bug houses, and insect books. 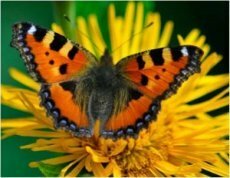 Our knowledge of insect species may even become so refined, we’d learn how to be more precise in our methods to attract them to our gardens, and garden centres might provide the information, tools and beneficial insect houses to do this (– not forgetting other beneficial invertebrates of course). Right: a 'bug house' to provide a home for beneficial insects. Isn’t It Time To Redress The Balance? Despite the obvious balance in favour of benign or beneficial insects in the eco-system, what we see is not only the promotion of pesticides for use should you see ‘a pest’, but also, pesticides promoted for preventative (prophylactic) use, such as treatments for vine weevil killer – just in case a vine weevil happens to wander along to your shrub, and find it sufficiently appetizing and vulnerable to decimate the thing. But what about potential effects of pesticides like vine weevil killers on beneficial insects and invertebrates? In addition, imagine taking pharmaceutical medicines just in case you got an illness, and never mind the side effects! It may seem strange to compare use of medicines on humans, with use of pesticides on the earth, but the earth is a complex body, a living inter-dependent eco-system (or web of life). 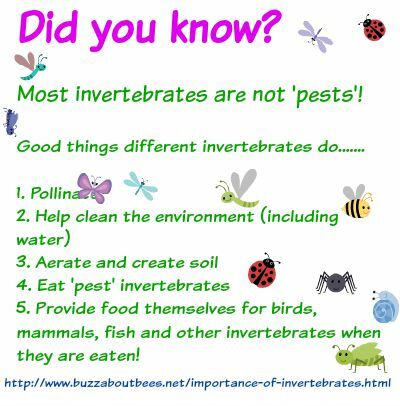 In summary, I recommend that we SPREAD THE WORD about beneficial insects. 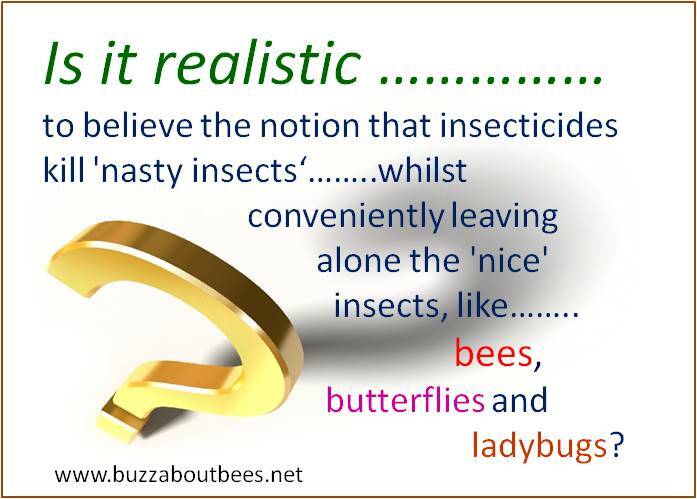 If you and I keep telling people and politicians that most insect species are beneficial (999 out of every 1000), eventually (and together), we might make a dent in people’s perceptions about the need for using pesticides!